The Asian Human Rights Commission (AHRC) is writing to you to oppose the nomination of Parinya Sirisaragarn to the National Human Rights Commission (NHRC) of Thailand on the basis that he has been named in a 2007 NHRC report as the licensee of a salt company that has degraded the environment, and due to potential conflicts of interest. The case of Mr. Parinya clearly illustrates the need for a delay in the process and proper study of the backgrounds of the candidates. The fact that one of the nominees for the NHRC has himself been named in an earlier report as an alleged rights violator speaks loudly to the dangers posed by rushing the selection procedure, to which we have already referred in our letter to you of April 29 and our letter of April 25 to the chairperson of the Senate selection committee. To the case details, the AHRC has obtained a copy of NHRC Report 74/2550, dated 5 April 2007, concerning environmental degradation caused by salt extraction in Samrong Subdistrict, Nonthai District of Nakhon Ratchasima Province. The report followed the complaint of a local resident to the NHRC in 2005. According to the report, eight salt extraction licensees in the subdistrict have over some years seriously damaged the local environment. The damage includes soil erosion, land subsidence and collapse, and the entry of salt into the water table, making water undrinkable and unsuited for agriculture. Mr. Parinya is identified in the report as one of the eight licensees (Licence No. Jor.3-103-8/40NorMor). Even though his licence had expired on 2002 he had been permitted to continue extracting salt while an application for renewal was pending, up to the date of the report. The NHRC report recommended, among other things, that the eight licences be revoked within 30 days of the report being received by the relevant government department. However, the AHRC has confirmed that Mr. Parinya in his capacity as managing director of Kijsubudom Co. Ltd. is continuing to extract salt from the subdistrict. In addition to the above, which the AHRC notes has already been brought to the attention of the Senate by the Northeastern Natural Resources Protection Network in a letter last week, Mr. Parinya is involved in a variety of other commercial ventures that may bring him into conflicts of interest with the work of the NHRC. He has concerns in two companies, EMP Engineering (Thai-Singapore) industrial equipment company and Cartoonek (Thai) chemical industries, and he is a member of the Federation of Thai Industries Nakhon Ratchasima. He has also worked as a consultant for various private firms. In light of the NHRC report of 2007, not only should Mr. Parinya not have been nominated to the National Human Rights Commission of Thailand but furthermore, questions should be asked as to why he has continued to degrade the environment of Thailand through his commercial interests. The Asian Human Rights Commission therefore strongly opposes his candidacy, calls for him to be rejected from the list of nominees, and also calls for an investigation as to why his licence to extract salt in Nonthai was not revoked in accordance with the NHRC’s prior recommendation. Beyond this, the AHRC is concerned that there may be other candidates among the seven who are also unsuited for the commission on the basis of past and present activities, but as the procedure for their nomination and screening has been grossly inadequate and no time has been allowed for civil society organizations to look into their records and come forward with information of the sort outlined above, details on their suitability or lack thereof is wanting. In fact, the AHRC can identify only one person among the seven who has practical human rights experience and is manifestly suitable for the job to which he has been nominated. We point to Mr. Parinya’s case to again stress that by going ahead with the nomination process tomorrow, May 1, the Senate risks jeopardizing the status of the NHRC at home and abroad. 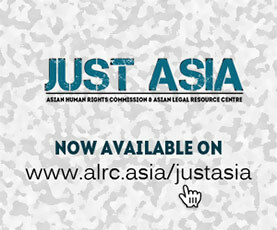 The Senate should also be aware that in the event that it goes ahead with the process, the Asian Human Rights Commission will be left with no option but to call for the downgrading of the NHRC from an “A” Status institution under the Paris Principles on National Human Rights Institutions on the basis of the Senate’s failure to comply with the minimum requirements for selection procedure and composition under the principles. This would, among other things, result in the NHRC being denied the right to participate actively in United Nations forums. The AHRC will also be forced to treat the NHRC of Thailand as a non-human rights organization. We thus urge you to seriously reconsider the selection and appointment of the NHRC candidates before proceeding with a vote tomorrow as planned.